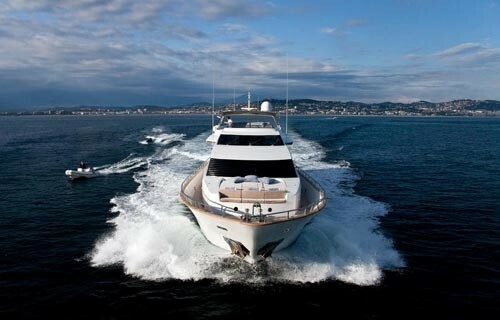 M/Y SYNERGY is a Falcon 100 measuring 30.70m (100' 8") built by Falcon Yachts in 2003. 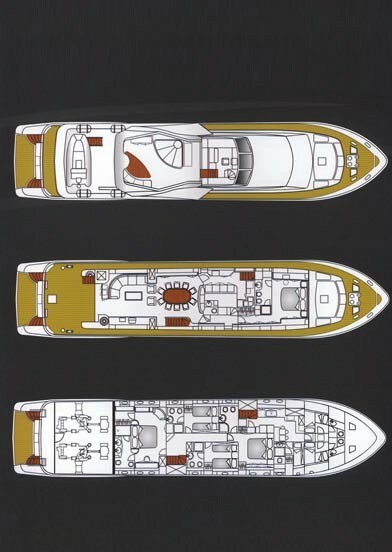 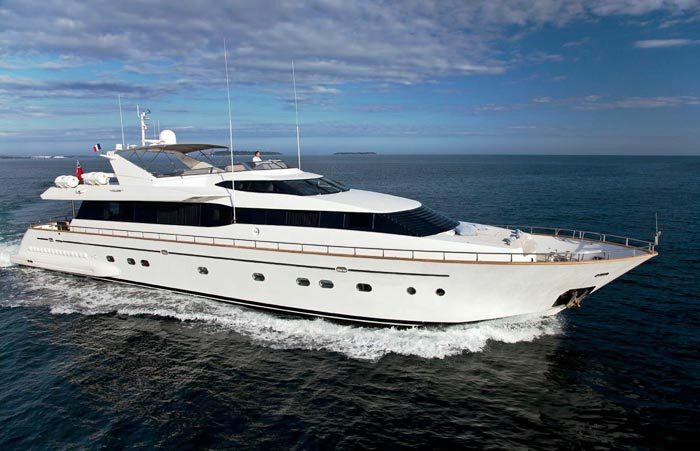 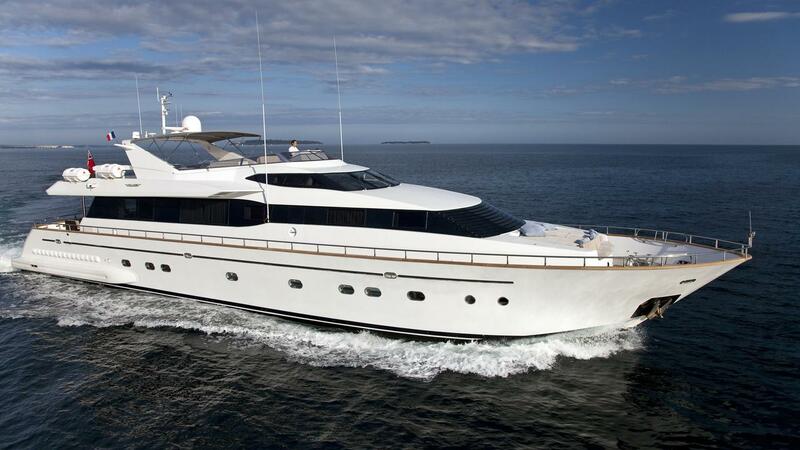 Since her introduction to the charter market in 2004, motor yacht SYNERGY has proven to be a successful charter yacht. 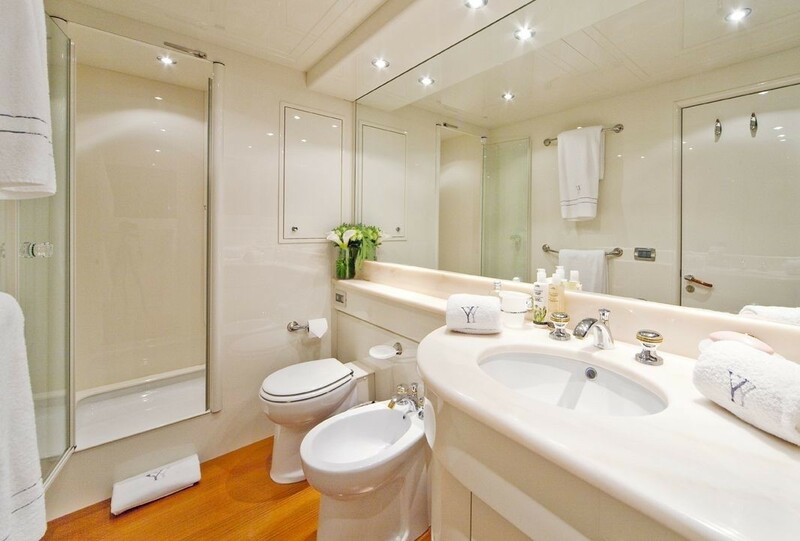 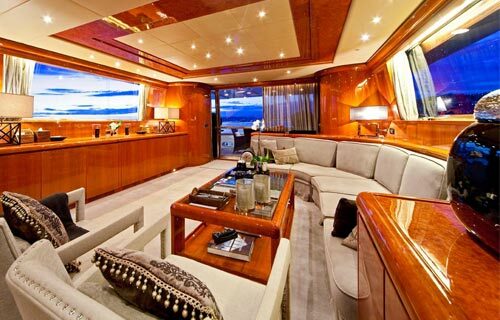 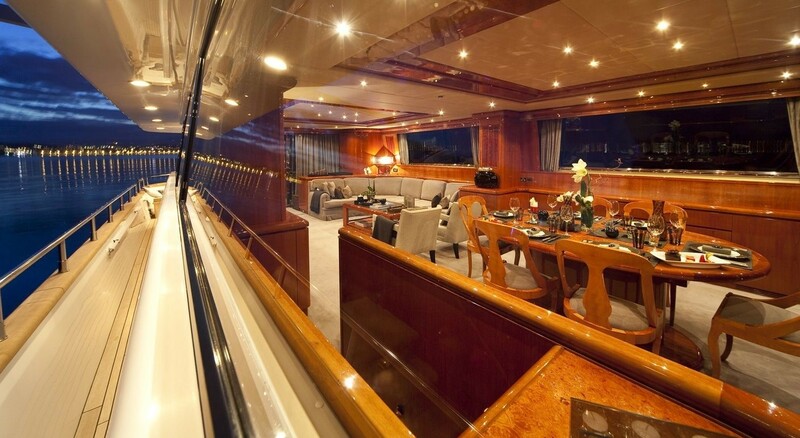 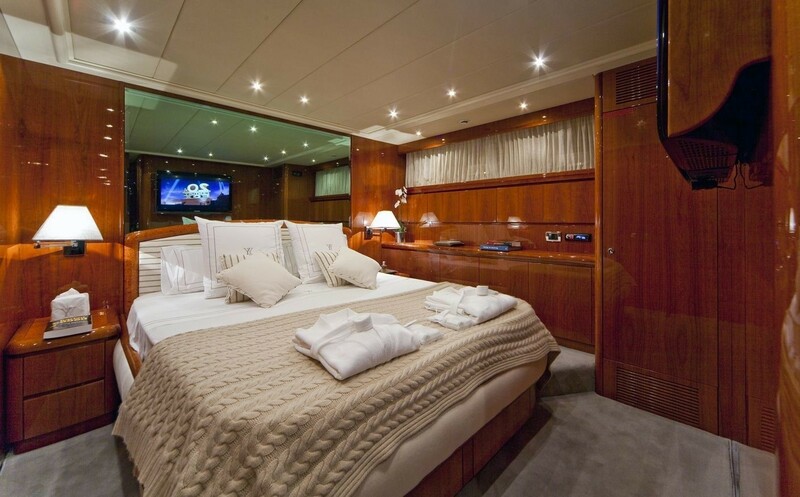 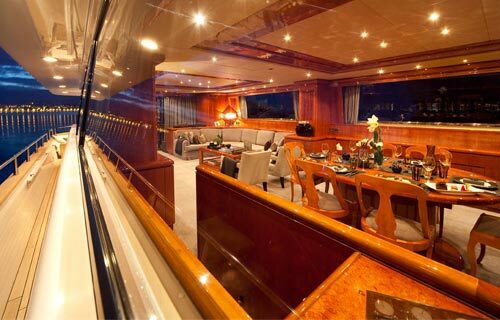 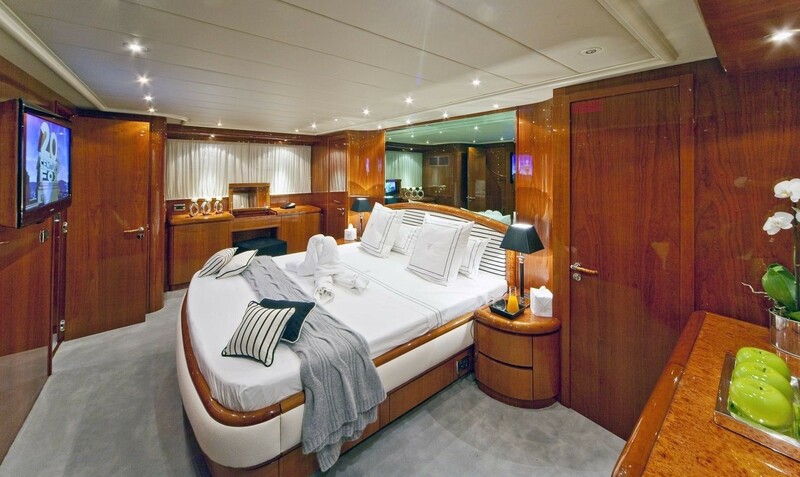 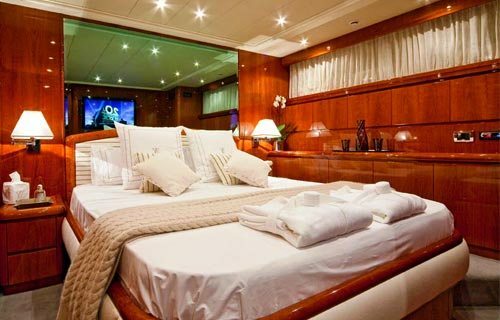 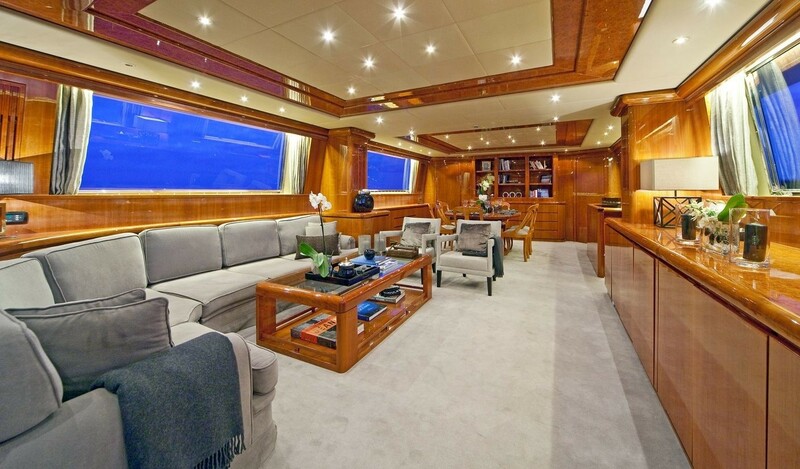 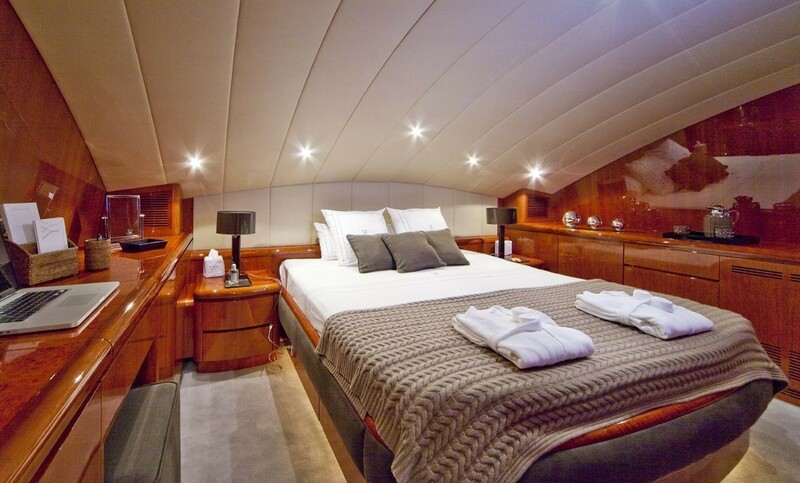 The yacht received an interior refit in 2008 which included a complete refurbishment with new carpet throughout, new entertainment and communication equipment including a new internet system. 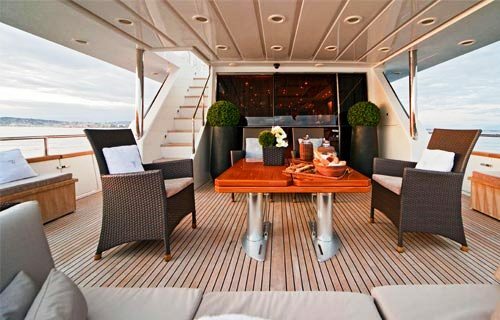 Luxury yacht SYNERGY features a beautiful modern “casual-chic” Parisian style interior with an open plan saloon and dining area that is perfect for entertaining or relaxing. 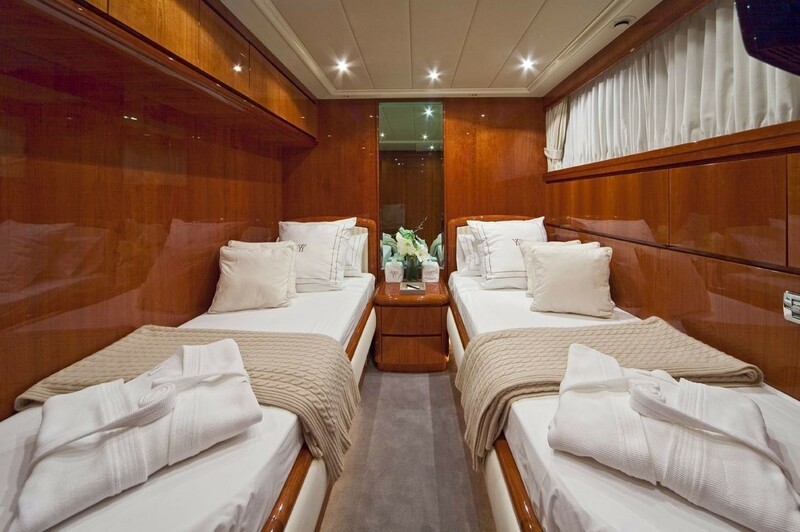 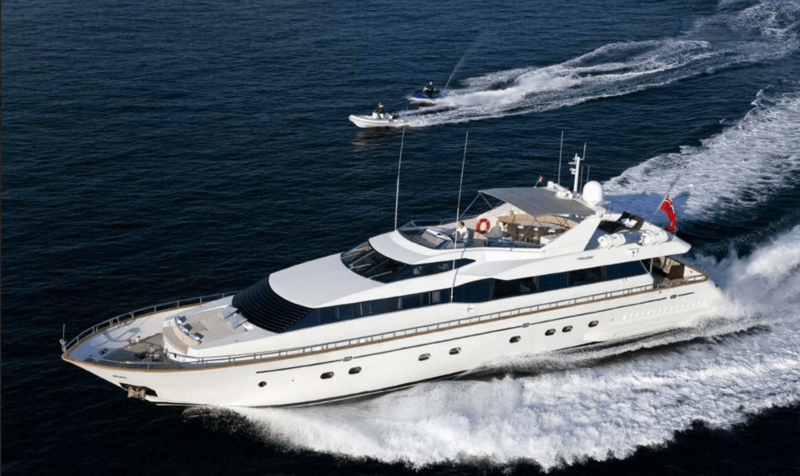 The Falcon 100 motor yacht SYNERGY is able to accommodate up to 10 guests in 5 cabins including an Owner’s Cabin located on the main deck forward with King Size Bed and ensuite Shower-room. 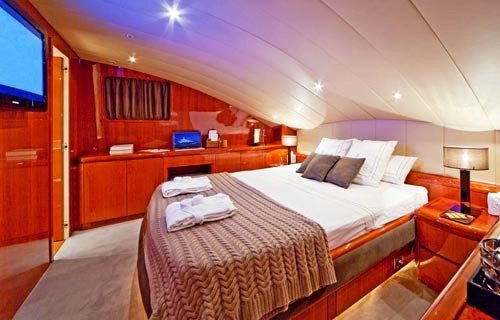 The remaining cabins are located on the lower deck and include a large VIP Cabin with a King Size Bed and ensuite Bathroom, a VIP Cabin with Queen Size Bed and ensuite Shower-room and two twin Cabins with a Pulman bunk and ensuite Shower-room. 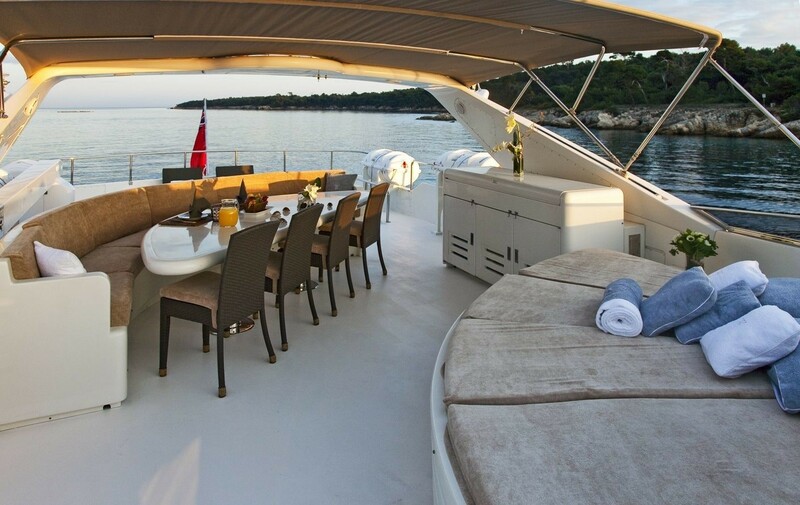 Yacht SYNERGY’s sundeck is ideal for family vacations or for corporate yacht charters with an al fresco table with a semi circular couch covered by a bimini top, a bar, a sun lounging area and further sun beds aft. 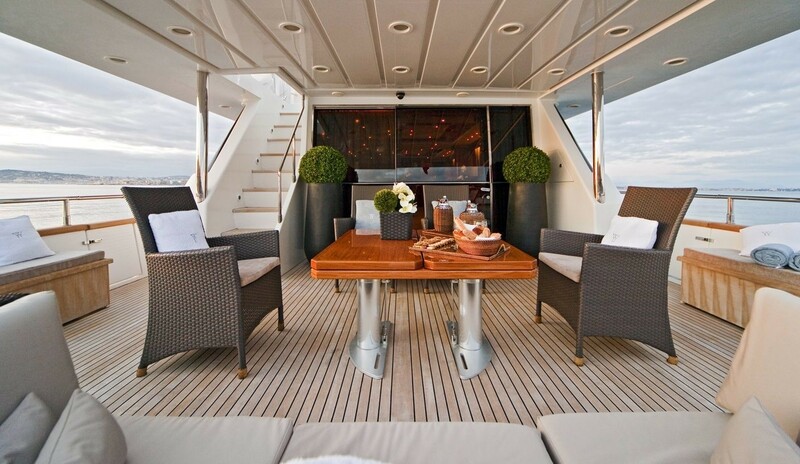 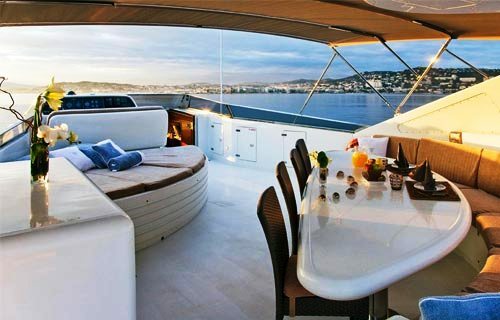 There is additional outdoor dining area on the aft deck and another area for sunbathing on the foredeck. 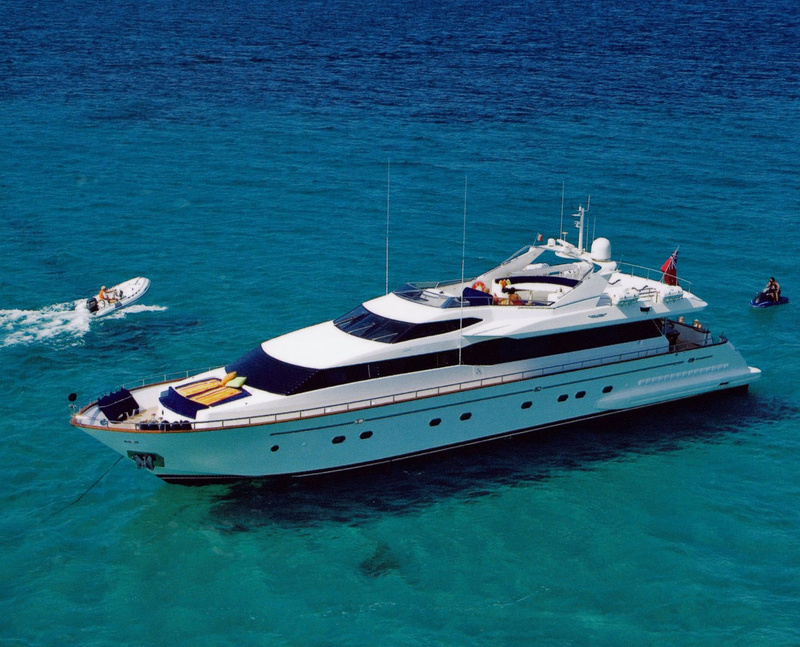 M/Y SYNERGY has a great selection of tenders and toys for charter guests to enjoy including a Novurania 430 SL with Yamaha engine of 70hp, a 2 seater Yamaha Waverunner FX cruiser 160hp, Water skis, a Wakeboard, Towable toys, 2 Kayaks and Snorkelling equipment. 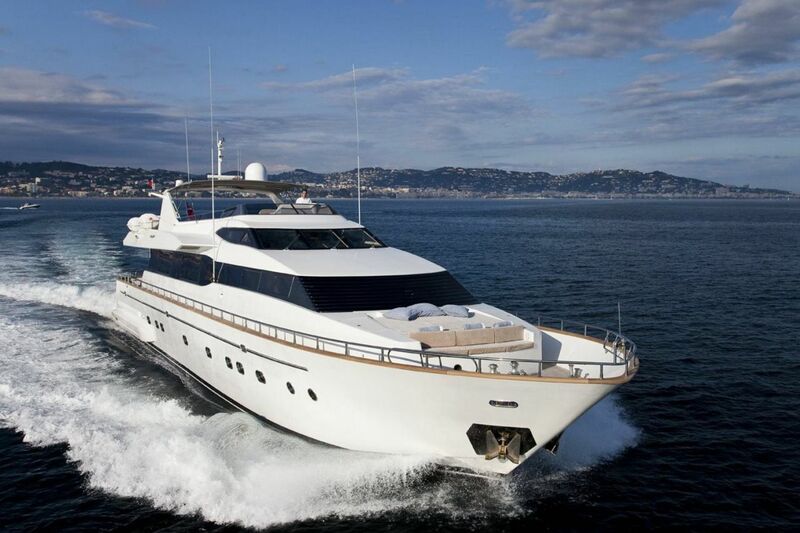 SYNERGY motor yacht is able to cruise at 20 knots with a top speed of 24 knots. 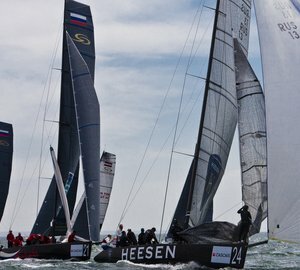 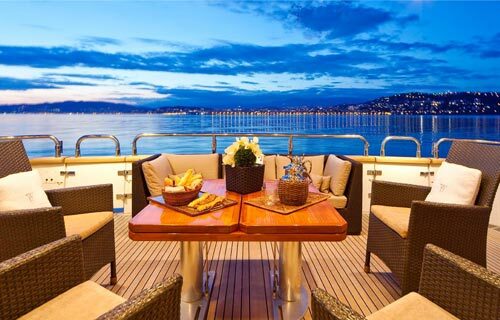 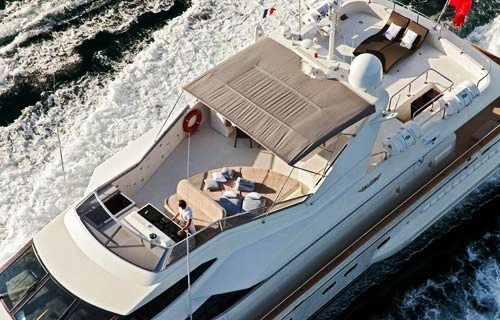 She has a dedicated and professional crew of 5 and is based in Cannes year round. The Falcon 100 motor yacht SYNERGY is able to accommodate up to 10 guests in 5 cabins including an Owner’s Cabin located on the main deck with King Size Bed and ensuite Shower-room. 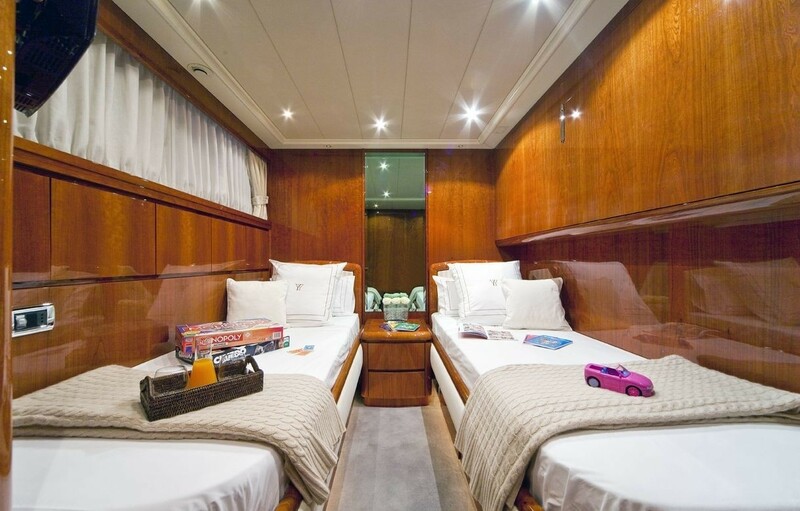 The remaining cabins are located on the lower deck and include a large VIP Cabin with a King Size Bed and ensuite Bathroom, a VIP Cabin with Queen Size Bed and ensuite Shower-room and two twin Cabins with a Pulman bunk and ensuite Shower-room. 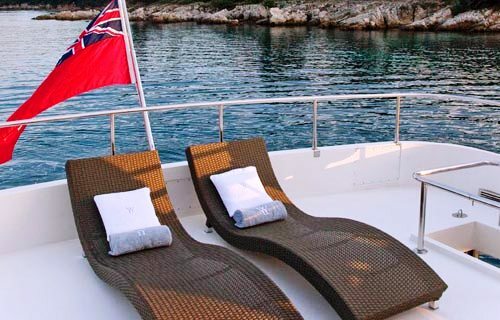 Luxury yacht SYNERGY has a great selection of toys and tenders for charter guests to enjoy including a Novurania 430 SL with Yamaha engine of 70hp, a 2 seater Yamaha Waverunner FX cruiser 160hp, Water skis, a Wakeboard, Towable toys, 2 Kayaks and Snorkelling equipment.